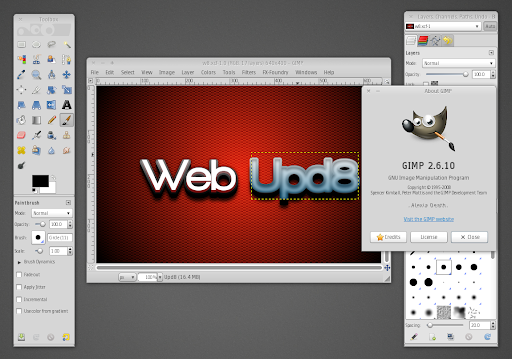 The GIMP versions 2.6.9 and 2.6.10 were released a few days ago. This new version(s) (basically there was supposed to be just a new version, but a severe bug in 2.6.9 was fix in 2.6.10) doesn't bring new features but only bug fixes - a list of fixed bugs can be found here. We decided to backport the GIMP 2.6.10 from Ubuntu 10.10 Maverick Meerkat to Ubuntu 9.10 Karmic Koala and Ubuntu 10.04 Lucid Lynx. Since this is a stable release, the GIMP 2.6.10 packages are available in the main WebUpd8 PPA. We've tested the Lucid version for both 32bit and 64bit (so the Karmic version has not been tested!) and everything works ok, even the latest GIMP Plugin Registry. Important note before trying to upgrade: if you've installed GIMP 2.7.x from a GIMP git PPA, you won't get any updates. This is obvious but I though I'd tell you anyway. And one more thing: this package is 100% identical to the one in Ubuntu 10.10 Maverick Meerkat (but built for Ubuntu Lucid Lynx and Karmic Koala) so don't report bugs here, but on Launchpad (although after using it for a day, everything seems to work just fine). Yet another important note: if you get a gegl/babl error, most probably you have installed a GIMP git version from some PPA. If you want to use this PPA, you must purge that PPA and all the packages that came with it. This is not an error related to the WebUpd8 PPA!